Adopting a pet is a lot of work. All pets have specific instructions and rules in order to keep them healthy and happy—especially when you have a lizard. When I was younger, my older sister adopted a lizard and my dad would have to go to the pet store and buy live crickets to feed her every week. Well, one day, my 13-year-old sister accidentally left the top of the cage open and, before you knew it, the lizard went back to the pet store because my mother found crickets on her toothbrush. While that sounds pretty bad, it’s not as bad as the experience Washington Post reporter Christopher Ingraham recently had. Ingraham and his family adopted a young bearded dragon lizard and, to prepare for feedings, he decided to order the live crickets in bulk. The crickets were shipped via FedEx and when they arrived, Ingraham decided to open them right away to check them out—thinking they were shipped in a container. But, alas! They were not. Ingraham opened the box and unleashed live crickets all over the house. 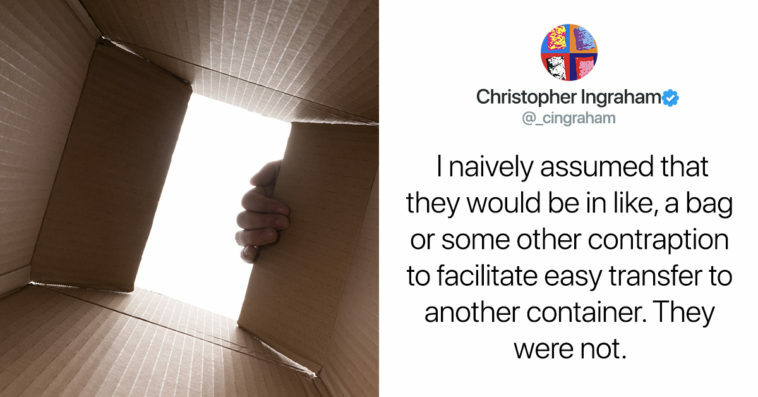 They were in a cardboard box. And I cut the tape and opened the box and SURPRISE! Crickets everywhere. It was the middle of the workday and I didn’t have time to deal with cricket logistics, so I put the tape back on the box. And then I put the box in the upstairs bathroom, the only semi-contained place in the house where I knew the kids and the cats and the dogs wouldn’t be able to get at the box and tear it open and unleash 250 hungry crickets into our warm, semi-humid environment. His wife, however, had already found out about them. About 20 minutes later I’m back at work on my computer, and I hear my wife in the kitchen: “where are these goddamn crickets coming from.” I freely admit I had not kept her fully up-to-date on my cricket purchasing plans. And at first I was like “okay, maybe one or two got out when I initially opened the box. No biggie.” I kept working. And, when he went to go investigate, things were pretty out of hand. I say “That’s a good question. Let me check something.” I walk over to the bathroom. I open the door. There are crickets. Everywhere. For some reason my first instinct is to flush the toilet, as if that will do anything to solve the problem of crickets in all the other places that were not the toilet. I shut the door. “Uh, don’t come in here!” I try to sound cheerful. He soon realized his mistake. Apparently I had not sealed the box shut as well as I should have. I ended up rushing out to the shed, in the 18″ of snow and below zero temperatures, to pick up a spare aquarium we had. I spent about 45 minutes collecting crickets from the bathroom. And, while he tried his best, it didn’t truly work out for the best. I tried to collect all of them. It was like the world’s shittiest game of Pokemon. But here we are, roughly 10 hours after the initial catastrophe, and stray crickets are still turning up in odd places. People online were actually in tears. Best. Tweet. Ever. Thanks for the laughs! I read the whole thread out loud to my teenage son, and we both laughed a lot (we live in an area where we have lots of crickets in the landscape and have dealt with infestations). Wait til you can’t find that one who won’t shut up… Bon Chance! Everyone who’s owned reptiles has a similar story. Mine involved hissing cockroaches though. It. Was. Horrible. I am sorry for your cricket situation but I want to thank you for the vivid description. I never laughed so hard in a long time. I worked at UPS for a while and had a box of crickets bust open in my trailer once. Not nearly as cool as when it’s a box of candy. Your wife is clearly an amazing, understanding woman. I would not have kept that calm. Here’s to hoping Ingraham gets all those crickets.